bernardsformalwear.com is your exclusive destination for the latest wedding, prom and special occasion attire and much more! Here you'll find the top tuxedo styles each and every season, our ALL NEW online color gallery, Featured Designers and Special Offers. Let us take you beyond the typical tuxedo shopping experience and offer you advice from our expert stylists to achieve an unforgettable look on your Fabulous Day. 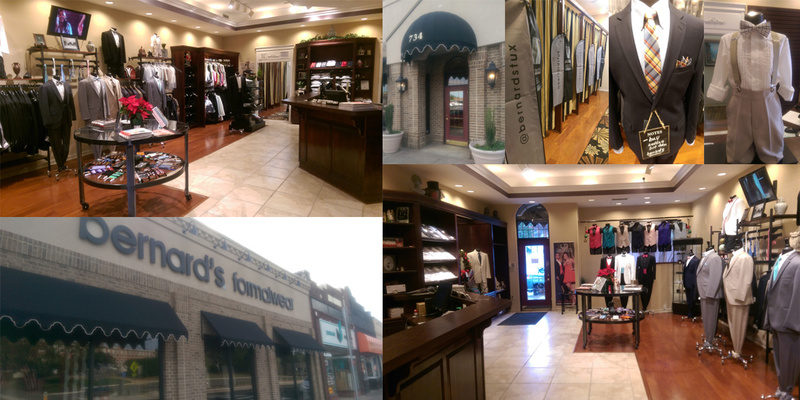 We started out as a small mom and pop tuxedo store on the corner of Club and Buchanan Blvd. As we grew, a move to the busy 9th Street area was made. Eventually the old Dailey's Hardware and Appliance Store became our permanent home. Through over 4 decades, we've seen plenty of styles come and go! From powder blue with ruffled shirts to mandarin collars, button covers and long "duster" style jackets to today's modern and slim fit styles. We've always kept up with the trends to assure our customers always look their best! With over 15,000 tuxedos in stock, we are Durham's ONLY local tuxedo warehouse! Last minute orders are always welcomed at Bernard's! You'll always find the best service and reasonable prices from your hometown tuxedo store - Bernard's Formalwear.